Just as I put my ADV motorcycle away for the winter, I learned that a north-south backcountry travel route through the wildlands of Utah is now chronicled in a new map and teaser video. The recently developed, 871-mile Utah Backcountry Discovery Route (UTBDR) is the third trans-state adventure-motoring route in an anticipated network of linked routes through each Western state. The new UTBDR includes portions of famous Kokopelli's Trail. The UTBDR crosses eastern Utah from the Arizona line southwest of Bluff to Bear Lake on the Idaho-Utah line, just west of the Wyoming line. Portions of the route are chronicled in my guide to Utah's adventure roads, Utah Byways. Butler Motorcycle Maps has just added a map of the UTBDR to its expanding catalog of references available to backroad explorers. Like its other durable, detailed and plastic-coated maps, it retails for $14.95. With a focus on the needs of adventure riders and drivers, I will review this and other Butler MC maps in an upcoming post. The new Washington Backcountry Discovery Route is established. It is well researched and documented. Many adventurous travelers are riding and driving it with the aid of free downloadable GPS tracks and Butler's innovative map of the route. 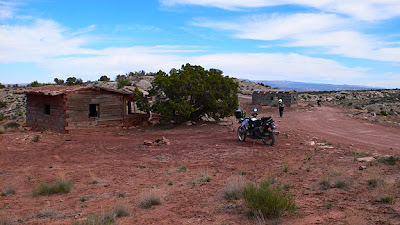 In time for the 2012 ADV season, there will be Utah. Additional states will be routed as well. Touratech has posted on its website a trailer video of a forthcoming film depicting the 871-mile Utah route. Butler Motorcycle Maps works with Oregon's Allan Cartography, Inc., noted for its genre-defining multistate Benchmark Road & Recreation Atlas series. Much of the UTBDR, or roads in proximity to it, are detailed as individual backcountry tours in my guidebook, Utah Byways. But I explored those routes in capable and reliable SUVs -- a Toyota Land Cruisers and 4Runners. Riding them as components of a multi-day border-to-border motorcycle journey will be an exhilarating new experience indeed. The UTBDR is an 871 mile off-road route that starts in Mexican Hat and runs north across the state of Utah to the Idaho border near Bear Lake. The UTBDR passes through a number of iconic locations including Moab, Valley of the Gods, the Abajo and La Sal Mountain Ranges, Nine Mile Canyon and the northern Wasatch Mountains. The route follows many low usage roads that wind through a number of mountain ranges and valleys, with a cumulative elevation gain of 86,996 feet. The film, which will be released as a feature-length documentary in early 2012, is being produced by Joe and Flora Lloyd of Curbsyde Productions and will be distributed by Noren Films. Additionally, a UTBDR map will be produced by Butler Motorcycle Maps and will be available before Christmas 2011.